Yay!! It's finally here! My 150th post! :) I wanted to do something really special for this particular post. 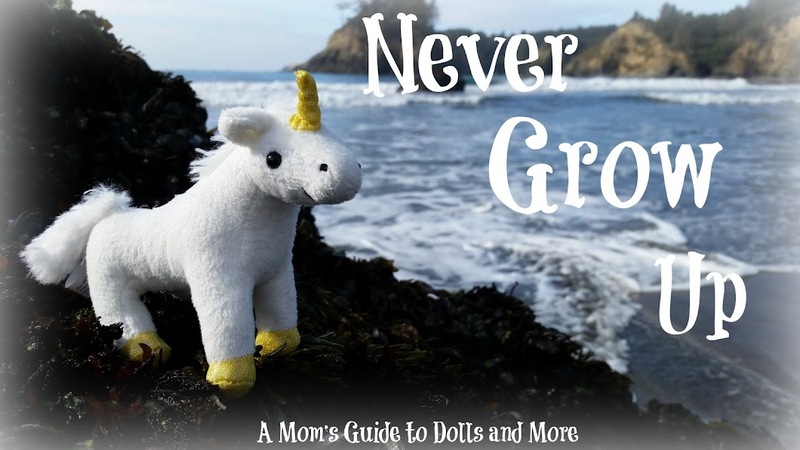 As I was trying to think of something creative, I thought back to how much fun so many of us had participating in Kellie's "Literary Heroine Blog Party" on A Maiden's Musings. 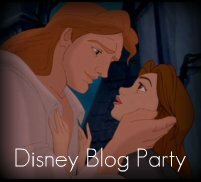 So I thought, "If I did a blog party, what type would I do?" 1. 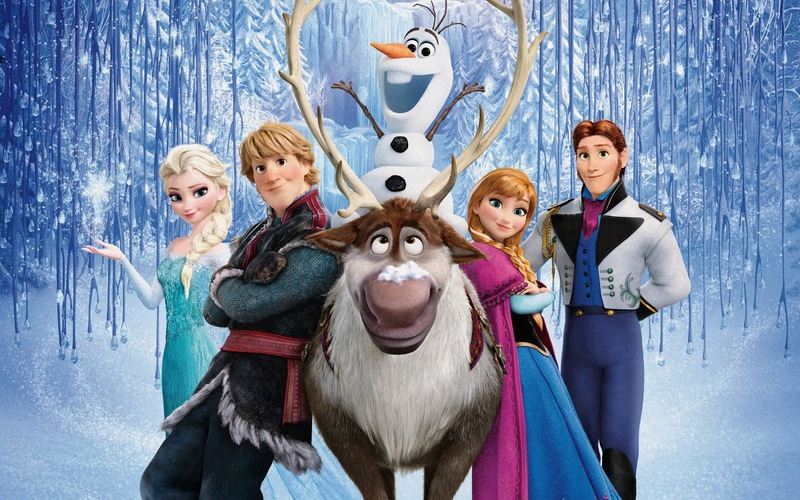 What is your all-time favorite animated Disney film and why? 3. What was the first animated Disney film you remember seeing? 4. It's talent night at your school/job/etc...You have to perform a Disney song. Which one would you choose? 5. 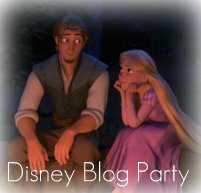 Name your top 4 Disney heroes or heroines (or any character, for that matter) and talk a little bit about why you admire them. 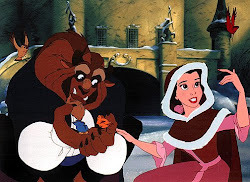 6. Who, in your opinion, is the most hideous Disney villain of all time? 7. If you could spend a day with any Disney character, who would you choose? How would you spend your day? 8. Which Disney character is the most like you? 9. 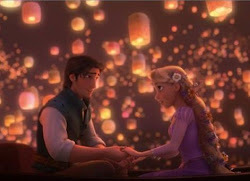 What, in your opinion, is one of the greatest movie moments in an animated Disney film? 10. If you could pick which film Disney would make next, what would the film be? Okay, guys. Stay away from eBay!!! It's just dangerous! You're sitting there, browsing through things and find something you really like. You think, "Hmmm, I'll just bid this one time and see what happens." You come back several days later (Who am I kidding? You check it every day just to see if you're still winning!) and find you've been outbid. It's the last day of the auction, and it's still a really good price. So you think, "Okay, well maybe I'll just bid a little bit more. Technically I shouldn't be spending this much right now, but I'm sure someone else will outbid me...and if I could win it for this, it would still be a really good price." Well, that in a nutshell is what happened to me on Wednesday evening. As any of you who have read through my Wishlist page already know, I've been wanting to get a My AG #25 to be a middle sister for Emma and Charlie. Well, I got my wish. Piper Olivia will be here within a week or two to join her sisters! One exciting thing is that hubby was able to get me a $10 discount through Bill Me Later (only recommendable if you pay it off every month...very important to remember, folks!!!!). I still have some things on AG Playthings for sale, so if those sell it will help pay for the doll. And if worst comes to worst, I'll start selling off a few pieces from my Beauty and the Beast collection to make up for it. The other day in Walmart (my favorite store!) ;) I found these adorable mini Reese's Peanut Butter cups. I realized that they'd be the perfect size for my dolls, so of course I had to buy a package! Have any of you checked out the jewelry section in Walmart lately? They have a great selection of anklets and bracelets for the summer. One of them jumped out at me as the perfect necklace for Emma. :) Silly me, I didn't take a pic of it in the package, but I got lots of pics with Emma modeling it. After I opened the package, I realized that the anklet was actually three separate anklets. I liked them best worn all together, though. The first week was really rough. I was STARVING, and as a result, really cranky with my family. I'm past the stage where I feel like chomping on a head of lettuce, just so I feel full, so that's good! :) I'm actually to the point where I feel very satisfied by the end of the day, and I'm already eating a lot less than I was before. Hopefully, that difference will show up on the scale soon. 2. I get a full-body workout without any floor work. This is great for me because I have bad knees. 3. The music is not atrocious. 4. It's not so involved that I have to be completely unavailable for my kids. So, I'm planning to continue on with Weight Watchers, the 3 miles twice a week, and the Bollywood workout once a week. Eventually, when I'm a little stronger, I may do Turbo Jam again, at least once a week. I'd have to do it after the kids were in bed, though. Some of the moves are pretty suggestive, and half the girls are in skimpy clothing. Plus, a lot of the songs they use are not songs I want my girls learning. All right, so everyone should have read my previous post about my first doll eye removal. If you haven't, I would suggest reading that one before you read this one. Once again, if you have problems seeing AG dolls in pieces and parts or without eyes, just skip this post now!!!! I got my two doll heads I'd ordered in the mail (the wigless TLC Sam head with brown eyes and the eyeless, wigless #25 head). Feeling confident, and a bit unstoppable after my previous success, I bravely plunged into my next eye swap. And this time, my hubby was on hand to take pics! So, here's a pic of the TLC Sam head before eye removal. 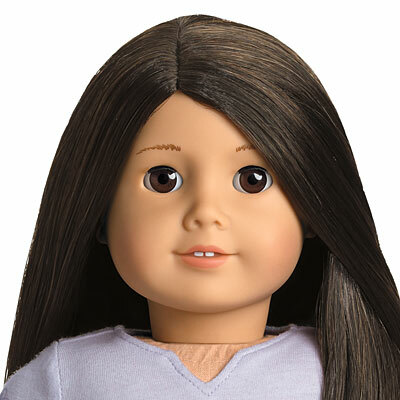 I was pleased to discover that she actually had beautiful Pre-Mattel eyes with soft, brown lashes (the newer Mattel eyes have stiff, black lashes). As before, I put Sam's head upside down in the same container and started boiling my water. When the water was fully boiled, I poured it into Sam's head cavity and set my timer for 3 minutes. After the timer went off, when Sam's head was nice and soft and squishy, I poured out the water. Then, using my wooden spoon handle, I pushed against the back of the eye cavity. AG doll heads have special "pockets", if you will, that hold the eyes. When the doll's head is nice and soft from the boiling water, applying pressure to these pockets will push the eyes out of the front of the head. ...and here it's almost all the way out. Next, I did Sam's left eye. And, voila! Both eyes are removed! You'll notice that these eyes have a white plastic piece in the back instead of black. That's because her eyes are Pre-Mattel. Now, it was time to put boiling water in the #25 head. I must admit, I made the mistake of pouring the still hot water from the first head back into this head. This was NOT successful. Even in that short amount of time, the water had lost enough heat that it didn't get her head soft enough. I ended up having to start all over again with another pot of boiling water, and another 3 minutes with the water in her head. After that, her head was nice and soft, as you can see from the above pic. You want to get the head as soft as possible. Be careful, though. The plastic gets HOT!! I had several experimental tools on hand to use to get the eyes in the right place. ...my, it was much harder with one eye in! I couldn't squish the plastic of the face as much. The eye holes were so much smaller than the eyeball itself, and it was really a chore. ...and tried, and tried. Still no success, and this time, I lost grip on the eyeball and it went flying! I actually had to fish one part of the eyeball out from under the dryer! By this time, I was wondering why I had started this stupid project in the first place. Once again, it was back to the boiling water and the 3 minutes, and then another attempt. By now, my thumb was aching, I was grunting and groaning like a woman in labor, and still that stubborn eyeball refused to cooperate! At last, I called in the big guns and asked hubby for help. Even with all of his strength, it took him a couple of tries, but he finally got the eye in. Then I started panicking because half of the eyelashes were stuck behind the eye socket! Thankfully, my husband kept a cool head and was able to get the eye turned around to its proper place. And here she is! It's kind of hard to tell, but her eyes are not exactly even. It was a bit of a bummer to have a doll with a slight wandering eye after all of that work. :( We think part of it may be the eye sockets themselves (they're shaped differently), and part of it may be the difference in the eyelashes (on one eye, the eyelashes have more of a natural curve). After she was all finished, I grabbed a spare wig I had on hand and started taking some experimental pics. Here she is with her hair parted in the middle and pulled back. Here she is with a middle part and her hair loose and flowy. For this pic, I tried a side part and a claw on one side. This is my absolute favorite pic of her!! I love how it turned out...especially since she's looking away from the camera, so you don't notice her eye deficiencies! A full view of her beautiful wig. The other thing I learned is that, while customizing my own doll was fun, I just really want a normal #25, made by American Girl. I've decided I'm going to hold out for one, even if it means that Emma and Charlie are without a sister for a while. I can wait. That specific doll is the one I want, not a customized doll. *WARNING!!! * If you are extremely sensitive to seeing dolls taken apart, eyeless, wigless, or anything else, SKIP THIS POST!!! NOTE: This was an earlier post that I did and was waiting to publish. Now, I have a newer doll eye removal post with better pics that I'm working on. Although some of the info may be the same, I figured there was enough here that you might still appreciate this post...if you can stomach it, that is! :} I should have my new eye removal/swap post up by some time this afternoon. I started by removing the doll's head and turning it upside down in a container that would hold it in place. ...and poured it into the empty head. I set the timer for 3 minutes and waited. I had two different wooden spoons on hand to use to pop out the eyes. Here are some pics of the eyes. They are made up of three parts. The black plastic backing, the eyeball itself, made of plastic, that has a small weight attached to the bottom, and a lightweight silver ring that holds the pieces together. An eyeless AG head...eek!!! (My daughters get really creeped out by this, so I only do these types of projects after they're in bed or when they're not in the room). The eyeball itself has two little pegs on either side that fit into two little notches in the black plastic piece. This allows the eye to balance and also allows it to open and close. The silver piece neatly fits over the entire eye and holds the two other pieces together. There was sparkly makeup and other gunk on the eyes, so I used some rubbing alcohol to remove it (per an AG Playthings board member's suggestion). ...but then they clouded over almost immediately after they were cleaned. I'm told that either clear fingernail polish or sewing machine oil applied to the eyes is supposed to remove this. I didn't find out for myself, as I decided to cut my losses with a smelly doll and sell her before I couldn't get my money back. I've since heard, though, the the person who bought her from me had success removing the cloudiness with clear finger nail polish. Here's a close-up of the closed eye. Here are the three separate pieces. Sorry, stinky Blogger was at it again, uploading my pics sideways!